Recently, Dr S’thembile Ngidi, 32, made history when she graduated from the College of Medicine South Africa as KwaZulu-Natal’s first-ever black female oncologist – and only the country’s second. She admits this does come with some pressure, but she uses it to spur her on and to encourage others to get to where she is. This, together with her fierce determination and fearless attitude, makes her a force to be reckoned with. It’s been part of her grand plan to impact the world in a significant way. “I’ve always wanted to be different, to make a mark and leave a legacy. I look up to people like Steve Jobs, Albert Einstein and Richard Branson, and Hamilton Naki, who taught himself science. I’ve also adopted the Adidas line ‘Impossible Is Nothing’ as my philosophy. I understand my worth and I know I belong here,” she says. Her plan to become a doctor was kick-started when, as an asthmatic little girl, she would marvel at how doctors had the ability to put a smile on the face of an ailing child. This had such a profound impact on her that she made up her mind well before her teens that she wanted to pursue a career in medicine. She wanted to wear that white coat. 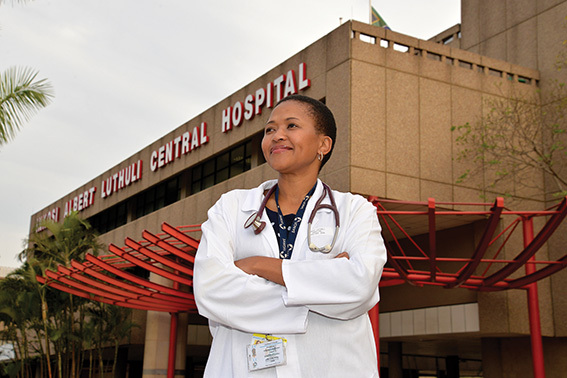 The daughter of a nurse and a social worker, Dr Ngidi, who works at Inkosi Albert Luthuli Central Hospital, is from Port Shepstone and grew up in Gamalakhe township. She rates the support of her parents as monumental to her triumph. She attributes her success to sheer hard work and understanding the importance of devising a plan and sticking to it. “It’s always good to know from the word go what you want in your life, because then you can chart your life. I picked my subjects carefully, and then I performed at a certain level. I made sure I got the points I needed to get into medicine, and exceeded that just to get in. Getting excellent marks was part of her study plan; the main objective being to get above 70% for all her subjects, especially Biology, Science, Mathematics and English. A bookworm and self-confessed ‘nerd’, she got four distinctions in matric. She then pursued her medical studies at the University of KwaZulu-Natal’s Nelson Mandela School of Medicine from 2002 until 2006. After doing her two-year internship, followed by one year of community service on her way to becoming a doctor, she then worked as a medical officer in the ARV clinic at KwaMashu Polyclinic in 2010. She obtained a medical officer post in oncology later that year. In 2012, she got a registrar post at Inkosi Albert Luthuli Central Hospital in Radiation Oncology. She credits the KwaZulu-Natal Department of Health for changing her life by awarding her a bursary to pursue her studies. “I had academic colours in high school. After being approached by the university and invited to study, I applied for a bursary with the Department of Health. That was a huge relief for us… when I actually got sponsored to fulfill my dreams. Oncology deals with the prevention, diagnosis and treatment of cancer. It is one of the most rapidly-evolving areas of modern medicine due to technological advances and the ever-increasing understanding of cancer. Dr Ngidi was attracted to it because there’s such a broad scope for research within this young scientific field, one that only came into existence in the 19th century. With ongoing research including Cancer Immunotherapy, which ‘wakes up’ a patient’s own immune system to fight cancer, it seems there are promising developments that aim to beat cancer in the not-so-distant future. 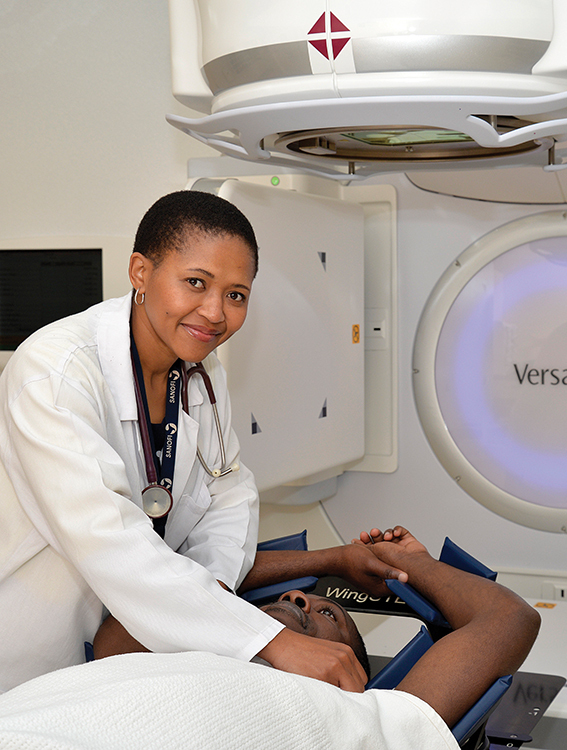 In terms of Radiation Oncology – the treatment of cancer using radiation – Dr Ngidi believes SA is also doing well. “We have ideal machines for treatment and we have made good strides, but more still needs to be done. I got into the field because of its vast scope for research and advancement. I want to invent something,” she says. are still some of the best strategies to beat cancer. “If cancer is treated early, it can actually be cured. So, what we always preach is that, ‘if you feel a lump, don’t waste any time’. Come forward and get it checked. We need to destigmatise disease and accelerate health education. It’s something that all of us, including the media, need to do.” After getting her Master’s in Radiation Oncology, Dr Ngidi plans on obtaining a PhD in the field. “There are very few people with a PhD in my field,” she says. There is no stopping her. Dr Ngidi hopes her life story will inspire others who might want to follow in her footsteps. She is a great believer in building yourself, building your country and leaving a legacy. Radiation oncology refers to the medical specialty that uses radiation (X-rays, gamma rays or electrons) to treat cancer. It is one of three main specialties, the other two being medical and surgical oncology, involved in the treatment of cancer. Radiation therapy is a form of cancer treatment that uses beams of intense energy to kill cancer cells. Radiation therapy most often gets its power from X-rays, but the power can also come from protons or other types of energy. The high-energy beams come from a machine that aims these beams at the problematic point on your body that requires radiation treatment. Don’t be afraid. Decide what you want to do, have a plan and align things in such a way that you can get there. Nothing comes easy; you need to be prepared to work. If you want be a doctor, study hard and pick the right subjects. You must have goals and dreams: that’s the essence of life. Early preparation is one of the most important building blocks. Start getting good marks early on; your consistency and hard work will get you noticed by the right people. You have to make people want you. Broaden your mind. Read a lot; Google is a good tool. Research your field and think outside the box. Don’t get into a market that’s oversaturated. If you do your research, you’ll know where you need to go. Have a positive self-image and don’t limit yourself in your abilities. I face a lot of racism in my work, but I use any discouragement to spur me on. It’s important to understand your worth. I always tell myself, ‘I belong here’. And I read the Maya Angelou poem, Phenomenal Woman to myself.